Lions and Pilots and Bots posted a nice write-up here. Catch not one, but *two* performances by THE SHAKE UPS this year at Gen Con's 50th anniversary, on Saturday, August 19th! The first new music from the band's upcoming Steven Universe-inspired project, The Shake Up In Beach City, has just been unveiled! Check out a non-album cover version of "We Are the Crystal Gems (Steven Universe Theme)" as well as a brand new original, "Cheeseburger Backpack," HERE! Both are also available for download via iTunes, CD Baby, and wherever quality independent music is sold. 'The Shake Ups In Beach City,' the band's upcoming Steven Universe-inspired album, now has an an official release date, as well as a pair of CD release shows! The album will be available from online retailers (and the band's web store) beginning Friday, May 5th! A 21+ CD release show will be held that evening at Radio Radio in Indianapolis (also featuring Doctor Who tribute Time Crash and Labyrinth/Bowie tribute The Goblin Kings), with an all-ages release show on Saturday, May 6th at Hero House Comics. Complete details for both events can be found on the "Shows" page! The Shake Ups In Beach City! For those who may be wondering what the band has been up to, The Shake Ups are working on TWO new musical projects for release in 2017! 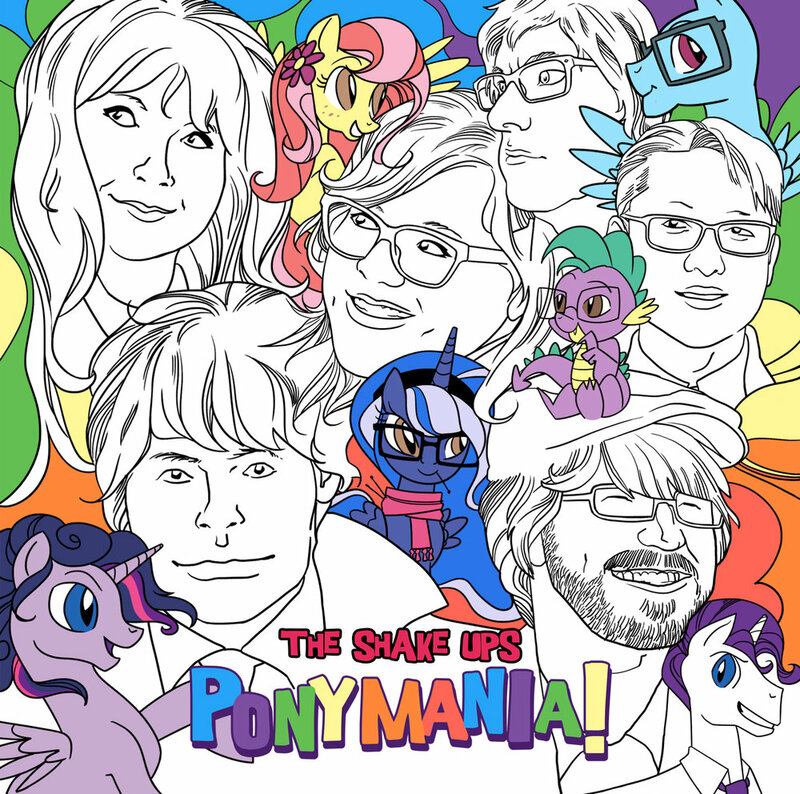 One will be a My Little Pony-inspired album to follow up last year's popular Rock Candy. Prior to that venture, the band will realize a project inspired by another fandom that has received similar pop culture accolades to MLP: Steven Universe! The Shake Ups In Beach City will fuse the band's signature power-pop stylings with elements from the Steven Universe series to create a brand new collection of family-friendly musical gems. The Shake Ups In Beach City will debut in the spring of 2017. Check out a teaser trailer HERE! 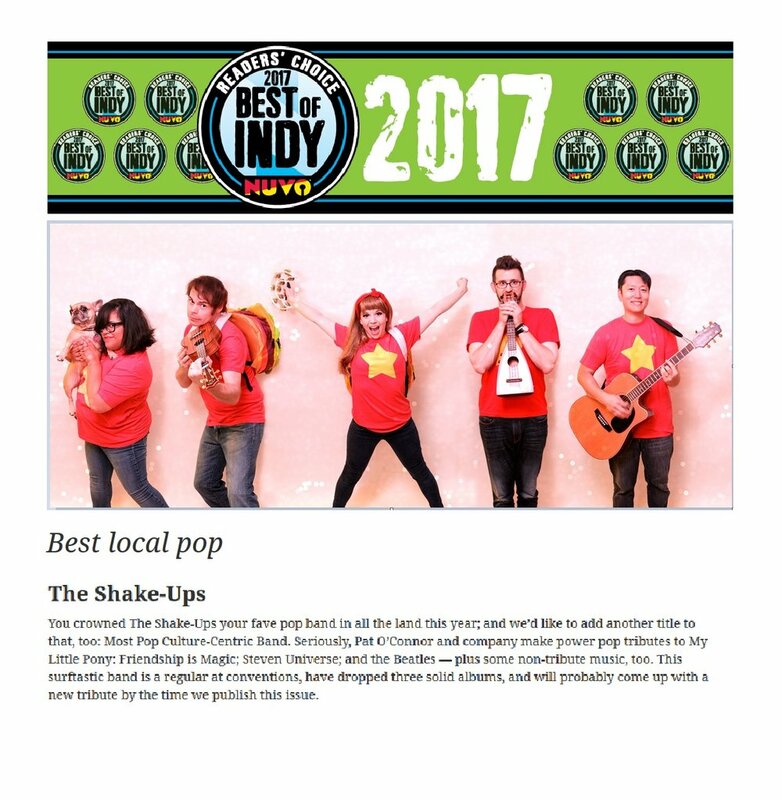 The Shake Ups In Ponyville have been awarded "Best Local Pop" in Nuvo Newsweekly's annual 'Best of Indy' Reader's Poll (as well as runner-up for "Best Local Album")! We're very thankful for all of our friends and fans, local and abroad, for your support! Our new album, Rock Candy, is available now! Get your copy via CD BABY or through our official WEB STORE! Our music releases make great gifts for the pony fan in your life... And why not grab a t-shirt while you're at it? Rock Candy is coming to iTunes, Amazon, Google Play, and wherever quality independent music is sold, so watch for it! You may also wish to check out the FIRST SINGLE, a tribute to DJ-Pon3! Don't miss our CD RELEASE SHOWS on Saturday, December 12th in Indianapolis! We have an EARLY SHOW at 7 p.m. and a LATE SHOW at 10 p.m.
'Rock Candy' - Now Available For Pre-order! Featuring 14 new pony-fied tracks and serving as the debut of our full Mane Six-piece band, Rock Candy is an Equestrian smash of unbridled proportions! The album will be officially released in one month, but U.S. residents can pre-order it now to ensure delivery before Christmas! We will be playing TWO CD RELEASE SHOWS in Indianapolis on Saturday, December 12th - an all-ages event at Hero's Emporium (7 p.m.), and a 21+ event at the Melody Inn (10 p.m.). Hey, Rari-Lee here! I’m the bassist for the Shake Ups in Ponyville. I have a lot of fun playing all-ages music with these guys . . .